Last night the we had an opportunity to view the Lindisfarne Gospels on their last night on display in Durham. What a marvelous book with an amazing story! The kids had asked how long the tour would last, I think Meg was afraid it would be boring. It turned out that we had to help move them both along at the end of the evening or they would have stayed till midnight. 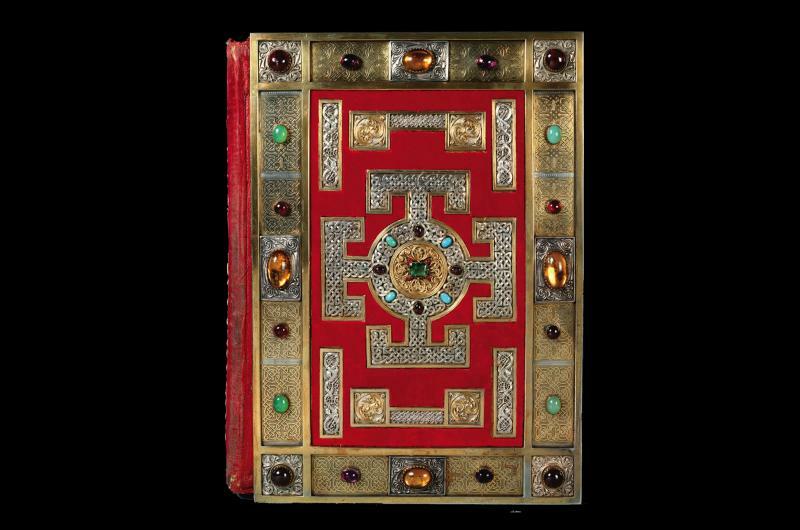 The Lindisfarne Gospels are on loan from the British Library and the exhibit explores how and why the manuscript was created. The amount of work that went into creating the velum pages alone was staggering. The skins of over 130 calves were stretched, scraped and buffed to make smooth velum paper. Have you ever tried writing with a quill pen? These monks on the island of Lindisfarne copied the gospels onto these beautifully crafted velum pages with such precision they appear to be printed by machine. As Joshua noted early in our tour, no mistakes could be made, another calf would have to give its life and the work on the page would begin again. 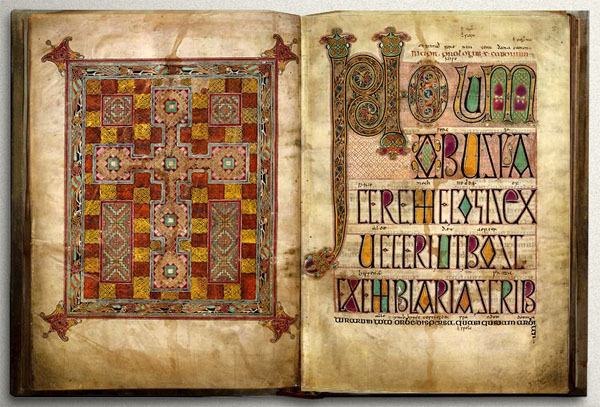 These gospels became the first translation of the gospels into Old English, the language of the Anglo-Saxons. This English translation is called a gloss. The gloss was added three centuries after the book was made. The script alone was very laborious but add in the highly colorful intricate drawings and paintings and it become a masterpiece indeed. Each Gospel writer is given his own unique, beautiful portrait. 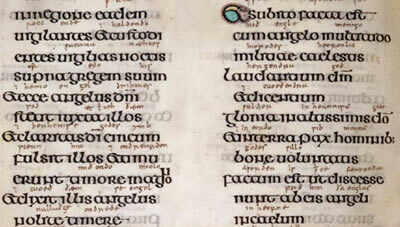 There are many highly detailed drawings in these gospels. One of the most famous is the cat with its belly full of birds. No one can quite explain why the cat is present or why he has feasted on so many colorful birds. It is a mystery whose answer must have accompanied the illustrator to his grave. The community of monks at Lindisfarne was pushed away from their island home by raiding Vikings in 875. These monks fled with the body of St. Cuthbert and the Lindsifarne Gospels and other relics and wandered the area of Northumbria for seven years. After many years St. Cuthbert’s community finally came to rest in Durham after reportedly the coffin carrying the remains of St. Cuthbert became ” rooted to the spot” and could not be moved. The community took this as a sign that the saint’s remains were to have their final resting place here in Durham. William the Conqueror ordered the building of the cathedral and it was begun in 1093. This week in our home school history time we will attempt some copy work of the gospels with a quill pen and experiment with creating our own ink colors. We may trace or color the cat with our homemade inks. Keep watching and we will share our attempts on another post. History is certainly not dead. It is all around us and we are excited to experience it in every detail as well as add our little part to HisStory. Was this the copy made at the Holy Isle? You MUST take a day trip there, but check the tide timetable. You can only get on the island during low tide!! Just looked through the book on google. i’m sure it is more impressive in person, but it was still impressive on-line.